The new standard for Smart Charging consists of a lot of individual pieces that together form the complete puzzle. The aspects that we research include humans and their behavior – what do they want – the development of the ICT-protocol with which the car and the charging point communicate, technically upgrading the charging infrastructure, developing user-friendly mobile phone applications, what the local smart grid – from solar panel to car – looks like, how discharging your car to your home works, how electricity from wind turbines can be linked to charging cars, what the chances are for the electricity grid, and more. Many more. The research themes are jointly developed by all partners in the Living Lab Smart Charging and are continuously in motion. We work towards standards. What works in one project, is applied and used as standard in another project. In this way we bring together the individual building blocks – in a pragmatic and empiric manner. Sharing knowledge is a key element. Every partner brings in unique knowledge and experience which is needed to set the worldwide standard. Below you find a list of the wide range of research themes that we research together. An electric car has a battery. The development of these batteries is going rapidly. Batteries become cheaper, lighter, they can store more and more energy, and they can be charged completely in a shorter period of time. How does this development relate to the price of electric vehicles and the sales market and emergence of the electric vehicle? How can charging services and hardware respond to the fast take-up of energy in the battery? And when do we need a static battery (e.g. Tesla Powerwall) instead of car batteries as storage? To enable smart charging, a lot of interaction is needed. For example between the electric car, the charging point and the back office system that controls the charging points. Interaction and communication is also needed between different parties that play a role, such as private parties, energy suppliers, grid operators and consumers. Standardized communication protocols make alignment between involved stakeholders possible. A communication protocol is actually a set of agreements that describes how the communication between individual components and between parties should take place. This enables communication between different systems in a uniform manner. By open protocols and standards an open market is created, which will lead to competition and innovative charging services that align with the EV-driver’s preferences. A growing number of charging points and an increase in functionalities (Smart Charging, V2X) has an effect on the importance of cyber security. Furthermore, the involved stakeholders have a social and legal responsibility to arrange adequate security. Currently there is no uniform standard in the field of (cyber) security for the (public) charging infrastructure in the Netherlands. Various manufacturers, operators and clients have requirements in place, but there is no uniformity. An important step has already been made by a cooperation between ENCS (European Network for Cyber Security), ElaadNL and three Dutch grid operators – Alliander, Enexis and Stedin. They have created a professional set of cyber security requirements, which has already been applied in practice. Because of the expected growth of electric vehicles and infrastructure, it is important to already arrange cyber security in the right way. With Dynamic Pricing we mean adjusting charging prices to the time of charging in relation to the supply of renewable energy and the available capacity on the electricity grid. This could mean that charging prices are low when there is a lot of supply of wind energy, e.g. in the middle of the night when the wind is blowing hard and there is little demand for energy. How can this be shaped in practice? And how do we make sure that all involved stakeholders apply the same standards, so energy can be exchanged and traded mutually? Together with the stakeholders we will try to answer these – and other – questions. All car brands that have released an electric car, have a vision on electric driving and often work with different charging speeds and technologies. How will this develop itself? Will there be cars with an inductive charging technology? What is the size of the battery and how large will it become? Can cars charge ultra-fast? These aspects influence the amount of electricity that can be fed to and taken from the car, and therefore determine the effect on the electricity grid and the costs for the user. Important developments to be a part of, to closely track and to look for cooperation. The growth of renewable energy is important to shape the energy transition. The growth of the number of electric vehicles – and therefore the battery capacity on the road – needs to keep pace with the growth of renewable energy that is produced. Only then we will become green. This research theme also includes concepts such as production, trading platforms, off-grid energy and private grids. Questions that we want to investigate include: is it possible for a consumer to go off-grid using an electric car and solar panels (with off-grid we mean generate, store and use energy completely cut-off from the grid)? And is it possible for a consumer to trade energy using his or her electric car? The success of Smart Charging depends to a great extent on the people that drive and charge an electric car. There is a wide range of users who each have their own needs. These needs vary when it comes to the type of charging (chargers with a normal speed, fast chargers or inductive chargers), type of domain (private, public or semi-public) and these needs vary regarding the type of transport (passenger transport or heavy duty, but also business or private transport). It is important to get the needs of these different types of users right. Are users aware of the chances that Smart Charging offers, for the environment as well as financially? How do you motivate people to drive on renewable energy and offer flexibility if possible? What do people respond to, what incentives and rewards are important? What smart charging services can we offer users? Behavioral research is necessary to gain more insight into the (expected) behavioral effects regarding electric mobility and it provides input for what market model fits best. To charge smart it is important to use information from equipment at charging locations, to handle local circumstances in an optimal manner. There is, for example, communication with the inverters of solar panels, the control panel of heat pumps and the smart meter. In the Living Lab Smart Charging the interoperability between the charging point and its environment is shaped by new and existing interfaces. Interfaces are the link between different systems and equipment. They enable communication and bring together two worlds, namely the automotive-industry and the traditional energy market. 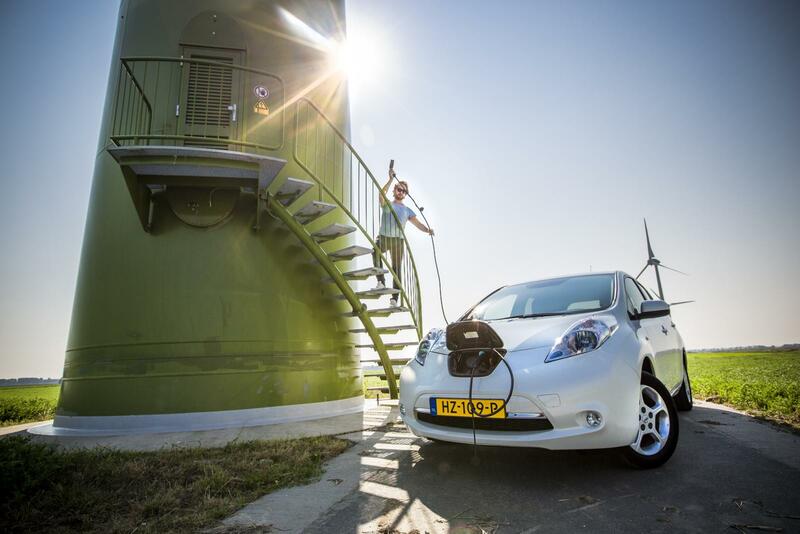 The Netherlands has an international leading position in the field of electric driving. There is a unique amount of (public) charging infrastructure that is also interoperable. The market works together which provides chances to shape the energy transition: by temporarily storing abundant renewable energy in car batteries and use the energy when there is demand. Together we develop this in the Living Lab Smart Charging. The Netherlands will export the lessons learned, hardware, protocols and standards and continues to promote an international open market. Interoperability means an EV-infrastructure that is accessible to anyone under equal conditions and enables market parties and systems to communicate and exchange data. For an EV-driver this means freely using charging infrastructure, regardless of location, car brand or type of electric car, or charging card or mobile phone application. This is already possible to a great extent. The next step is to charge smart everywhere with a single card or app. It is important to safeguard, develop and strengthen interoperability. Doing this we increase convenience and therefore its use. After collecting information of the EV-driver and the environment, a decision has to be made in what way smart charging will take place. What vehicles can make optimal use of locally produced energy? What charging sessions offer the most flexibility to charge smart? Do I want to charge green and/or cheap as an EV-driver? Do I want to drive using my own solar energy or on wind energy? And what will be the charging scheme of each car? These questions are answered by charging algorithms: a set of decision-making rules that puts together an optimal charging scheme based on available information. A lot of stakeholders – including the EV-driver – have their own ideas about this. These ideas are brought together in the pilot programs of the Living Lab Smart Charging, in order to experience what works best in different situations. The rise of electric transportation increases the demand for (renewable) energy. The peak demand of a Tesla is equal to the energy demand of ten households. The electricity cables and transformers that take care of the needed energy supply have a certain maximum capacity. When this capacity is exceeded by a high demand, this results in an accelerated ageing of these materials which might overburden the grid and even switch parts off. When the number of electric cars continues to grow and we do not act on it, there will be a peak demand for several hours (during the current evening peak) which exceeds its maximum capacity. This can be avoided, because there is plenty of available capacity during the day and during the night. It is important, for the grid operator as well as the energy company and society, to spread this power demand or move demand to moments when the load is low. Smart Charging allows you to do this. The technology of Vehicle2X (V2X) focuses on the use of the electric car as battery and buffer: an indispensable step in the energy transition and in driving on solar and wind energy. When there is more supply of renewable energy, the car can temporarily store this surplus. The user determines what happens with the energy: they can use it to drive, they can feed it back into the grid, or they can use it for other purposes (e.g. the household). This technology and associated agreements are at an early stage of development and require a lot of research. Further standardization is necessary to make these smart technologies a success.